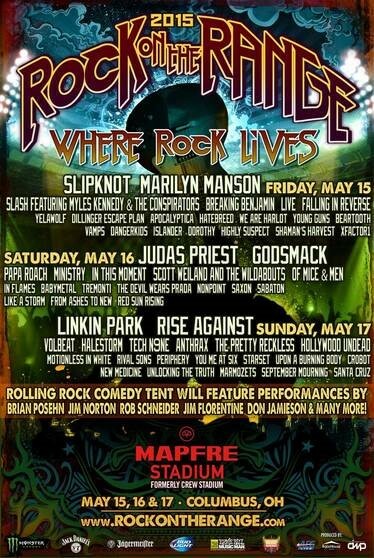 The daily band lineups, various fan activities, and an interactive art installation with graffiti artist RISK have been announced for Rock On The Range, America’s premier hard rock festival, May 15, 16 and 17 at MAPFRE Stadium (formerly Crew Stadium) in Columbus, OH. Currently less than 1,000 tickets remain for this year’s event. Rock On The Range celebrates its ninth year in 2015 with a stellar lineup of top rock bands led by multiplatinum artists Linkin Park, global rock juggernauts Slipknot and heavy metal legends Judas Priest–who are currently celebrating their 40th Anniversary. The festival also features the Rolling Rock Comedy Tent and a full vendor village. For full festival details and to purchase tickets, visit www.RockOnTheRange.com. New in 2015 is an interactive graffiti art installation by RISK. Kelly Graval, the multi-talented fine artist, illustrator, and graffiti artist known as RISK (www.riskrock.com), will be curating an interactive art exhibit to be displayed on site. The exhibit will showcase multiple live demonstrations by RISK and will allow ROTR artists such as Slipknot’s M. Shawn Crahan (Clown), and fans the chance to interact and add to the exhibit. Visit www.RockOnTheRange.com for more details about participating artists. RISK has been synonymous with the Los Angeles art community for three decades. From his days pioneering the painting of freeway passes to studying at the USC School of Fine Arts, and from his THIRD RAIL series and clothing line to gallery and museum shows around the world, RISK has solidified his place in the history books as a world-renowned graffiti legend and proven to be a rising star in the contemporary art world. The Rolling Rock Comedy Tent will feature sets from some of the biggest rock n’ roll influenced comedians, including: Rob Schneider, Brian Posehn, Jim Norton, Don Jamieson, Jim Florentine, Rod Paulette, Jeremy Essig, Brent Terhune, Joe Howard, Bill Squire, Jay Snyder, Bill Arrundale, Jake Iannarino, Kenny Smith, and Craig Peters. The Ernie Ball presents the Rock On The Range Battle Of The Bands is back for 2015, offering unsigned bands a chance to perform on the Ernie Ball Stage at Rock On The Range and receive over $15,000 in gear and prizes, along with an all-expenses paid trip to Columbus, OH. Monster Energy: Monster Energy will help fans celebrate the weekend with artist autograph signings at the Monster Energy Hospitality Rig. As always, come by the Monster Hospitality area for an ice cold Monster Energy to refuel and keep the party going all weekend long! Additional ROTR sponsors include: Marshall Headphones, Matador Beef Jerky, Victory Records, Another Century Records and Roadrunner Records. ROTR Weekend Stadium GA Tickets are on sale now at www.RockOnTheRange.com. Weekend Field GA Tickets, Hotel and Camping Packages are sold out, but the new VIP Upgrade for the Jack Daniel’s Old No. 7 VIP Lounge is still available for only $125 while supplies last. The Jack Daniel’s Old No. 7 VIP Lounge will feature amenities such as dedicated Wi-Fi, charging stations, private restrooms, premium food options and more. A limited number of discounted tickets are also available for active military through Rock On The Range partner GovX. For full details about all ticket options, visit: www.RockOnTheRange.com. Rock On The Range–part of the World’s Loudest Month festival series–has sold out in advance for two years in a row, with 120,000 concertgoers on hand in 2014. Currently less than 1,000 tickets remain for this year’s event. In 2015, ROTR will welcome live music’s top cable channel, AXS TV, to film the weekend as part of their live festival coverage, allowing fans around the world to experience Rock On The Range. Rock On The Range is produced by Danny Wimmer Presents, AEG Live, MAPFRE Stadium (formerly Crew Stadium), and RockHouse Presents. The multi-stage music and lifestyle event features a potent lineup of bands on three stages over three days. The nationally renowned festival that’s centrally located in the heart of the country is proud to be part of the World’s Loudest Month festival series, and annually draws huge weekend crowds since its inception in 2007.